Horse Sense: As '99-'04 Mustang GTs ageand become affordable starting material for hot-rodders, they willsuffer more and more bottom-end failures. Standard production materialsare fine for making 300 rear-wheel horsepower, but once you add a blowerto these cars, you're on borrowed time. Our repair of a broken 4.6 GT engine started with a call to ProPower.They shipped out an affordable rebuild kit that features forged rods,high-quality Mahle pistons (0.020-inch over), and all the necessarybearings and rings to get this thing back up and running. For thisstory, Paul's Automotive Engineering handled all machine work andassembly. Luckily, Paul's Automotive Engineering (a frequent stop on our testingand evaluation circuit) has a complete in-house machine shop facilitymanned by Steve Barker, an accomplished engine builder. Paul's cranksout all sorts of hot Ford iron, in addition to repairing 4.6 modulars ona regular basis, so this was a routine engine project for them. Pop goes the piston! One too many rattles of detonation, over-revving the engine, or high cylinder pressure, and this is what you get- a major bottom-end failure from the Two-Valve 4.6 engine. our supercharged '00 GT lost two pistons when the rings broke and the ring lands let go. But we're lucky we got it before it ate up the cylinder wall of the block or let a flame front rip through a rod. Evaluating the damage, we found terminal piston failure due to elevatedcombustion pressures and perhaps a slight over-rev on the owner's part.The old 5.0 engines could take much more than the modular engines, whichare saddled with hypereutectic (or hyper-pathetic as they've becomeknown) pistons and cracked-cap, powdered-metal rods. The new stuff cango at any time. In all, we lost two piston rings, with the ring landsgetting shattered shortly after. Surprisingly, the car ran OK until wegot aggressive with the throttle (and boost), then we knew something waswrong. So, at a minimum, we needed new pistons and stronger rods. Enter Dale Metlika from ProPower and his many different modular-enginekits. He's seen dozens of engine failures just like ours, and hiscompany has designed kits for all sorts of applications. If you want tobuild something that will take 1,000 hp, Dale has you covered. If, onthe other hand, you want to simply get your modular Mustang backtogether with some stronger parts for the least amount of money, you'rereading the right story. With our parts in hand, our test car's owner began removing the engine.This is a labor-intensive task, but it can save a bunch of money. Dropoff the engine at your chosen machine shop, then pick it up after thework has been done. If you feel adventurous, you can strip theaccessories, cams, and heads from the engine. But, unless you know yourway around a modular engine, we'd leave that to the experts like thoseat Paul's Automotive Engineering. This is an account of what it took toget this once-damaged short-block back up and running. ProPower supplied us a set of forged Mahle pistons in 0.020-inch over(3.572 inch) size. This necessitated honing the block, but it ensuredgood ring seal. Check out this dramatic comparison shot of the old rod and the newforged-steel units we sourced from ProPower. With a good tune and solidpistons up top, theses rods will swing happily up to 650 hp. Remember,the Two-Valve 4.6 engines have a strong, cast-steel crank and a heartyblock, so once you fix the weaker rods and pistons you'll be in goodshape. 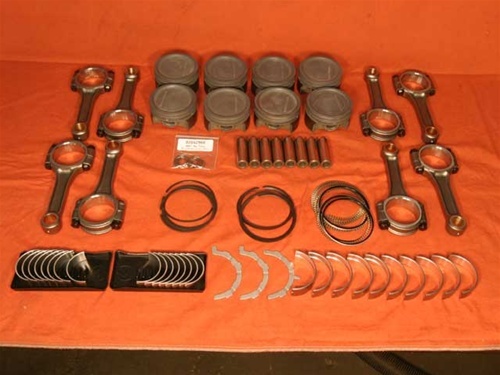 We also ordered a complete bearing set and other miscellaneousparts through ProPower, which included Mahle pins and spiral locks,Sealed Power rod bearings, and Federal-Mogul main bearings. It's a wiseidea to get these parts at the same time so your engine parts supplierknows what you're putting together--it will save you a lot of grief andconfusion down the road. Once the broken motor was pulled from the Mustang and taken apart, wegot to work on the machining. Paul's Automotive Engineering has acomplete engine-building facility at its massive Mustang super shop.Head Machinist Steve Barker began the project by honing the block. Thisprocess was mandatory to ensure a smooth cylinder wall. Using deckplates, Steve torqued them to the appropriate specifications to emulatethe stress placed on the block by bolting down the heads. Once the deckplates were in position, Steve started the honing process of cuttingeach cylinder wall out to the prescribed 3.570 inches. The crankshaft will have to be balanced since you're changing the weightof each rod and piston. Steve has weighed out each rod and piston, hungbob weights on the crankshaft, and is balancing the crankshaft.Appropriate metal is added to the crank to ensure it's balanced. Steve uses a dial-bore gauge to check for main-bearing clearance. Thedial should read "zero" since it's been set to the size of the hole. Steve uses a micrometer to check for clearance of the crankshaftjournal. Paul's uses 0.0025-inch clearance on these engines. Once theclearance checks out, the crank can be installed. Lube the main bearings prior to crank installation. Steve drops in the crank and makes sure it moves freely. Make sure youdon't smack the crank into anything as you ease it into position. Here, the thrust bearing is being installed. Steve has already installedthe ARP main-cap fasteners. ARP stuff is used throughout the bottom end. Steve starts installing the main caps. This is the heart of the engineand keeps all the good stuff from breaking. He carefully installs themains in the correct position without scraping metal on metal. Steve lubes the threads on the ARP fasteners before installing the caps.This is part of the process of getting the correct torque reading whenyou tighten down the main caps. The dowel pins are gently tapped into position. This is a littledifferent from the typical pushrod Ford bottom end, and is unique to theTwo-Valve engine. They "sandwich" the main caps together for morestrength. The main caps are torqued down to 60 psi. The cross-bolts can then be torqued down to the prescribedspecifications. Then, as per the Ford design, the engine builder has toturn the bolt 90 degrees. There is a lot of pressure on these littlebolts and pieces, but these engines have proven to hold up under a lotmore power than we'll be making. Here, we're checking the crankshaft for endplay to make sure the crankcan't move front to back in the engine during use. Too much endplay, andeverything has to come down to determine the problem. We were perfectwith this assembly, which is typical of a Paul's Automotive Engineeringbuild. With the bottom side of the block together, we start to focus on thetop-side assembly. The rings are file-fit to ensure exact dimensions.Here's a close up of the ring filer as Steve gets the rings ready toinstall. As we did with the main bearings, the rod-bearing clearance needs to bechecked. Use a ring compressor to help guide each piston and rod into position.Rotate the crank to ease the mating of the rod bearings to thecrankshaft. Here, the rods are in position. Steve checks all the rod-side clearancesto ensure there won't be any contact when the crank is spinning at 7,000rpm. The rods are in position, and this shows what that looks like. Stevechecks all the rod-side clearances to ensure there won't be any contactwhen the crank is spinning at 7,000 rpm.